I came upon an article about RH factor, much of which I had seen before, modern science cannot explain the complete lack of the primate blood protein in RH negative persons (roughly 15%) . Combine that with the fact that they find blood genetics are extremely stabile over the millenia. There are physical attributes often associated with having the Rh negative blood type, such as lower blood pressure, cooler temperature, etc. Since it is often responsible for fetal and sometimes maternal death, Rh factor would seem to be the result of partial speciation. In the article they note that the highest concentration of RH negative persons was in the Basque region and note many other interesting facts about the Basques. I looked through the Zetatalk archives and found a few mentions of blood type but Rh factor is completely separate and I didn't see any text that directly addresses that component. I also didn't see any mention of the Basque people that didn't seem to be a news item. I did find the article where they define the primate ancestry of current and failed 'human' lines. http://www.zetatalk.com/worlds/w30.htm and they are primate in origin so 'should' be Rh positive. Can the Zetas comment on the significance/heritage/difference of Rh negative persons, noteworthy comments about the history of the Basques and the 'Aquarius' project, any implications about what/whose contribution accounts for the lack of the primate protein in Rh neg blood? [and from another] http://www.aoi.com.au/bcw/neanderbasque.htm This research included studies of DNA extracted from bones of Neanderthal remains. It was concluded that Neanderthals were probably a fully separate species from modern humans, not just a subspecies. Looking now at the evidence for the theory that the Basques are descended principally from Neanderthals. The Basques are well-known to have the highest percentage (around 33%) of Rhesus-negative blood of any human population, and so are regarded as the original source of this factor. Around 600,000 years ago, in southern Europe, a species of man separated off from the ancestral line, and we call this species Homo neanderthalensis, the 'N-people'. The blood of this species contained none of the factors A, B, or Rh. Much later, possibly around 200,000 years ago in Africa, the main human line had picked up the A, B, and Rh factors, and by then could be classed as Homo sapiens, the 'S-people'. [and from another] One of the quotes from Bill Cooper's descriptions of government operations. http://www.thewatcherfiles.com/cooper/operation_majority.htm "Aquarius is a project which compiled the history of alien presence and their interaction with Homo Sapiens upon this planet for the last 25,000 years and culminating with the Basque people who live in the mountainous country on the border of France, Spain and the Syrians." We have frequently mentioned that the Service-to-Self aliens who introduced themselves to the US government just prior to the days of Roswell often lied. In fact, they most often lied, as this is what the Service-to-Self do. These lies live on, in leaks from former MJ12 members and the like, and are time consuming to unravel, thus we tell the public to ignore all but the ZetaTalk website in their search for truth. Bill Cooper was a truthful man, faithfully reporting what he had learned, but what he had learned in great part was a pack of lies from aliens in the Service-to-Self. As with all lies, half-truths gain the greatest traction. The reported history of Project Aquarius, reportedly tracing an alien bloodline to the Basque people, is one such half-truth. The Basque people have a high percentage of Neanderthal genetics, and thus a higher than usual percentage of Rh negative blood. It has been identified in recent DNA analysis of Neanderthal bone marrow that Neanderthal had no blood components for A, B, or Rh, which came during later genetic engineering projects. Thus their high percentage of Rh negative blood reactions. We have mentioned that Neanderthal Man was stopped, his vas cut and replaced by another genetic engineering product, as he had problems digesting food native to the Earth. Recent analysis of Neanderthal caves has confirmed that he had a meat diet, almost exclusively, and the Basque people have a tendency to have many food allergies. Why would the Service-to-Self aliens report that these genetics were alien, a result of interbreeding or hybrids? They knew that the Neanderthal blood line would entrance and reward those trying to solve the puzzle, a half-truth to supplement whatever lies they wished to spin. Well of course all human genetics is the result of alien interactions, as homo sapiens is genetically engineered. We have explained that there were several races of man, and many, many steps in the process for each race introduced on Earth. In addition, it was presumed that mankind would interbreed, so that homo sapiens would eventually become a blended race, which is the trend on Earth. There is no alien based race. There is only mankind. Does this article prove an outside presence pressuring the cloud layer lower? Do the Zeta have any comment on the science behind this? [and from another] http://www.livescience.com/18604-cloud-heights-declining.html Over the last 10 years, the height of clouds has been shrinking, according to new research. For a decade, however, the Multi-angle Imaging SpectroRadiometer on NASA's Terra spacecraft has been watching Earth's clouds. The device's first 10 years of cloud-top height measurements from March 2000 to February 2010. They found that global average cloud height decreased by around 1 percent over the decade, a distance of 100 to 130 feet (30 to 40 meters). Most of the reduction stemmed from fewer clouds forming at very high altitudes. The period in question, from 2000 through 2010, is also the time when Planet X has been affecting the Earth, roiling the core, creating a daily Earth wobble, and twisting the magnetosphere. Cloud formation results when air masses of different temperatures clash, one more humid than the other. The longer an air mass can linger close to the ground, the more homogeneous the temperature will become in the layers above ground, thus preventing cloud formation. It is likewise true that stronger winds at higher altitudes will disburse differences, so that cloud formation at high altitudes are now being disbursed more readily. This is essentially a result of the Earth wobble, combined with particle bursts from rock under stress and greasy components from the tail of Planet X. A 1% change is insignificant, in the scheme of things. What IS significant is the fact that scientists have no explanation to cover the change. Is there still an event ahead that will "shock the world" or is that event no longer in our horizon? It appears that Zetas compassion for the unknowing world has led to the use of technology and actions to mitigate the 7 of 10 trauma that could have been visited on millions. If the pace of change has been slowed, however temporarily, then this changes several aspects in the spectrum of geological change. We predicted the possibility of tsunami on the Sunda Plate, in our original 7 of 10 predictions. This was reduced to nil by the slower pace, as even the heaping water from the collapsing Mariana Trench did little more than show up on buoys occasionally. 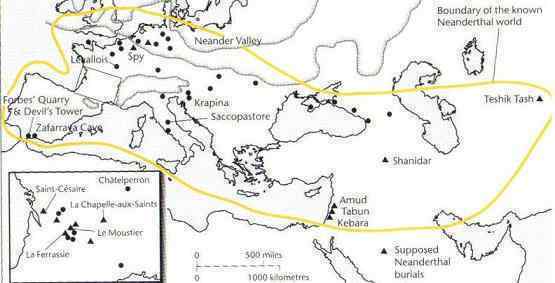 The world would have likewise been shocked had the sinking on the Sunda Plate occurred as originally predicted. The intense cover-up over the cause and extent of the lingering flooding was effective because they claimed for every new sinking incident that the cause was recent new rain. For the S American roll, now proceeding slowly, the original prediction was for magnitude 8 quakes all along the spine of the Andes, accompanied by sinking in the Caribbean Plate near the border with S America. Had these occurred in close order, the world would see that these incidents are related, but by being drawn out over time, alternate excuses can be given for each incident. The relationship of disasters to our predictions is thus blunted, and the battleground of awareness of what is pending, the pole shift pending, has switched to another realm. What will shock the world will now be something other than a sudden and dramatic plate movement, although the public will be able to review the 7 of 10 predictions and see that the results comply with our predictions. What is likely to shock the world is the drama being contemplated by the Council of Worlds, in their current battle with the cover-up. This will be something that the establishment has not guarded against, not even contemplated. This will be a series of signs to mankind that even the common man has not contemplated. The Tibetan New Year started on Feb 22, following two more self-immolations protesting the continuing occupation of Tibet by China. This sent me searching for any Zeta info on the subject of Tibet and it's history, of which there was actually very little. It's always been somewhat of a mystery to me as to why China was ever interested in Tibet in the first place, it being such a rugged and harsh environment. If the original motivation was religious persecution by Mao Tse-tung, those days have gone by. And if the Himalayas are destined to be absolutely uninhabitable after the PS, why fight to hold onto these lands? The Zetas have told us that the Dalai Lama is encouraging his followers to look to other leaders in other locations, so that they don't all rush towards Tibet during the earth changes and end up in worse shape. The protests are increasing and one would think that China would be just as happy to turn it's attention elsewhere, unless perhaps there is something worth hanging onto in Tibet. There was a book written by T. Lobsang Rampa called "Cave of the Ancients", in which artifacts of an advanced civilization are purported to be hidden in caves in the high Himalayas. Might this have any bearing on why the Chinese government invaded Tibet back in 1950? Perhaps something to do with the Roswell revelations in 1947? And why they are holding Tibet so tightly still? It occurred to me that there might be more to this than meets the eye. I found it interesting that Wikipedia presented the history of Tibet more as always having been a Chinese province, whereas the Tibetans vociferously declare otherwise. With the recent exposure of Wikipedia's insistent disinformation about Nancy, might their portrayal of Tibet's history be suspect as well? [and from another] http://www.causes.com/causes/47691-tibetan-freedom-movement/actions/1599912 In the past year, 22 Tibetans have set themselves on fire in the most pure and powerful expression of defiance to Chinese rule. The self-immolations in Tibet have shocked the world and galvanized the Tibet movement. [and from another] http://en.wikipedia.org/wiki/Tibet Following the collapse of the Qing dynasty in 1912, Qing soldiers were escorted out of Tibet and Tibet declared its independence. The region maintained its autonomy until 1951 when, following a military conflict, Tibet was incorporated into the People's Republic of China and the previous Tibetan government was abolished in 1959. Today, the PRC governs western and central Tibet as the Tibet Autonomous Region while eastern areas are mostly within Sichuan and Qinghai provinces. There are tensions regarding Tibet's political status and dissident groups are active in exile. [and from another] http://asianhistory.about.com/od/china/a/TibetandChina.htm For at least 1500 years, the nation of Tibet has had a complex relationship with its large and powerful neighbor to the east, China. The political history of Tibet and China reveals that the relationship has not always been as one-sided as it now appears. Indeed, as with China's relations with the Mongols and the Japanese, the balance of power between China and Tibet has shifted back and forth over the centuries. Throughout history Tibet has most often been an independent country, but a country China has always considered to be part of its domain. When planning for the future, for the Aftertime, however, China does not think of Tibet as anything as a wasteland, as being high country and so close to the new S Pole, it will be uninhabitable. The Actic offers sustenance to the Eskimos, but their sustenance comes from the sea, and Tibet will be landbound. So why is China gripping Tibet in a stranglehold? All expansionist countries seek to hold onto land along their periphery, as was true of Russia in the past, the Greek and Roman empires, and many European countries in their colonial interests. Beyond simple land lust, the Chinese interest in Tibet is due to a desire to hold the line on immigration when the Earth changes pick up the pace and SE Asia and in particular India find themselves flooded. Nepal will be a point where guns will be pointed at drowning refugees. China will attempt to stop refugees well before they arrive at lands being prepared for the new China homeland - the ghost cities and the countryside surrounding these now-empty cities. Prior to the pole shift, Tibet will house China soldiers tasked with preventing migration, and after the Pole Shift, the climate will prevent such migration. This is their plan. 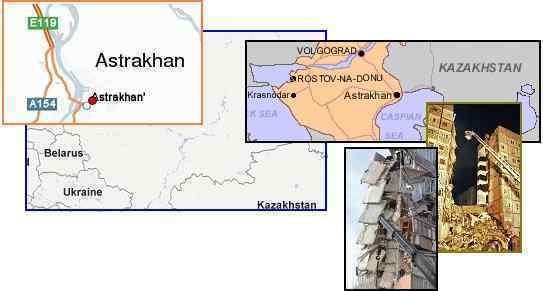 What is the reason of building collapse in Astrakhan, Russia? http://youtu.be/kbBrjJjeIlU [and from another] http://www.huffingtonpost.com/2012/02/27/russia-apartment-building-collapse_n_1304111.html An explosion apparently caused by natural gas has heavily damaged a nine-story apartment building in southern Russia, leaving two people dead and 12 injured. The explosion occurred in Astrakhan, a city 800 miles (1,300 kilometers) southeast of Moscow. The blast first blew out a lower section of the building. As people rushed to help, the upper six stories collapsed. Explosions of gas canisters in Russian homes and businesses are common. [and from another] http://www.washingtonpost.com/world/europe/10-killed-in-collapse-of-apartment-building Putin has ordered local gas company officials suspended pending an official probe, and four of the company's workers were detained on charges of violation of fire safety rules. Explosions caused by leaky gas pipes and canisters in Russian apartment buildings are common. Astrakhan is on a river, amidst a number of rivers flowing to the Black and Caspian seas, and undeniably in the Eurasian stretch zone that has been experiencing singing reservoirs, mud volcanoes, and sinkholes. We described some years ago a phenomena we called imploding buildings, where the substructure of buildings would lose their support, the piping and plumbing would sag, and broken pipes and collapsing structures would result. The Astrakhan explosion and collapse received phenomenal attention, from Putin (who visited the site) and media such as the Washington Post and Huffington Post in the US. Was this explosion so large, or the death rate so high, that this was warranted? Putin and the media are holding their breath, waiting for more imploding buildings and thus their rapt attention. They are giving away their mindset, their focus, in this regard. Why else was this particular explosion different from others? In ZT of Feb 11, 2012 the Zetas clearly explained the decision of the Council of Worlds to shatter the cover-up of Planet X. In the same ZT the Zetas commented on the Davos2011 annual meeting, indicating that the Davos attendees are in panic and are realising that their only solution is to rush to their bunkers early. In ZT of Jan 29, 2011 the Zetas explained that, if the presence of Planet X is seen as merely theory, the establishment is most likely to panic, and mow their citizens down in the streets. But at a certain point, the moment the elite realises that the Earth changes are not slight, the elite would have a different view of their future and they would increasingly run to their bunkers and hunker down. In ZT of Feb 18, 2012 the Zetas explained that the mystery boxes helped in slowing down the progress of 7 of 10. So the Council of Worlds highly influences the timing of the shattering of the cover-up about the presence of planet X, and the Council of Worlds also highly influences the pace of earth changes as part of 7 of 10. Meaning this is not in the hands of man, but it's the Council of Worlds who determine these boundary conditions of our school house. Also it seems that the Elements of Doubt related to the alien presence, about the poleshift and about the stalled orbit are maintained, as the earth is still being tipped, Venus is still being moved and light is still being bent to simulate the right position of the stars. Anyway this leaves the elite, even after the shattering of the cover-up of the presence of planet X, with many possibilities to minimize or even ridicule the impact of planet X on earth, and by this way to justify their non-communication about the presence of planet X. So can the Zetas, as in Jan 2011, consider to comment on the actual position of the elite? Will the shattering of the cover-up about the presence of Planet X result in the hiding of the elite in their bunkers (following the trend amongst the Davos attendees), despite the fact that the actual earth changes are less than first anticipated, also due to the installation of the mystery boxes? Or will the elite, in panic, mow down their citizens in the streets? Why would the establishment have reacted more strongly to a potential breaking of the cover-up in the early days (when there was scant evidence of Planet X) than they would today (when the Earth wobble and signs in the skies are obvious)? The Earth wobble puts the rising and setting Sun out of place, and the weather extreme. This cannot be hidden from the common man. A looming Venus and the visibility of the Planet X complex when viewed through something as simple as a floppy disc also cannot be hidden from the common man. Yet we stated as recently as a year ago that the elite would be more likely to panic and mow the public down in the streets should the cover-up suddenly break when there was scant evidence of Planet X. The Element of Doubt has been in place since the days of Roswell, to keep eager contactees from blurting out their status to family and friends and co-workers, and thus come under attack from those nervous about the alien presence. The elite, in particular, do not want the public getting snug with the visitors, as they fear losing their status. The CIA formerly harrassed contactees, as is well documented by notables like Whitley Strieber and Lea Haley. This likewise was a worry in the Council of Worlds, as many assassinations occurred among astronomers leaning toward informing the public about the approach of Planet X or the near presence of Planet X. The cover-up is in the hands of man, and could have gone in many directions based on the free will of man, but moved in the direction of a hardened stance. Thus when the 7 of 10 scenarios began unfolding, there was absolute denial in the Indonesian press, echoed in the press of other countries such as Malaysia which were likewise affected, so it was all blamed on rain. Despite absolute evidence of sinking, ZetaTalk and Nancy are not given credit for this astonishingly accurate prediction. As with denial in individuals, denial in a group such as the establishment can become more hardened as evidence mounts, and this seemed to be the trend. At the same time, as 2011 passed and 2012 began, it was apparent to the elite that the Earth changes had become obvious and most importantly, unexplainable. Global Warming no longer explained the "rising seas" that were only affecting the Sunda Plate. The rise in earthquakes could no longer be explained, and the USGS has gone from trying to control all reports to denying responsibility for reporting. During a surprisingly quiet solar cycle, NASA has been left without their main excuse - blaming the Sun. Issues like the singing and roaring Earth, recorded around the globe, have gone viral on the Internet while the establishment remains stunned. Thus, at this time the elite are increasingly eyeing their bunkers rather than formulating an attack. What attack would be mustered? Killing all of humanity? As the cover-up is cracked, there will at first be an upsurge of the usual attack - discrediting those who announce the presence of Planet X, weak explanations by the "experts" for what is seen and observed, and a rush of alternate theories for the Earth changes. But at a rapid pace, the establishment will resort to simply falling silent, and disappearing from public view. It is a war they cannot win, and they know this. Just wondering - was this cable in the Atlantic off the coast of Africa actually cut by a dropped anchor as stated? Or is it the effect of continued plate movements that have disrupted the internet service? [and from another] http://news.yahoo.com/ships-anchor-cuts-internet-access-six-east-african-150000191.html A ship dropped anchor off Mombasa, Kenya, and cut the Internet to six African countries earlier this week. It will take three weeks to repair the damage. In the meantime, the Internet in Kenya, Tanzania, Burundi, Rwanda, Ethiopia, and Juba, the capital of South Sudan, is functioning at a reduced speed. The Indian Ocean East Africa Marine Systems (TEAMS) cable, which connects East Africa to the United Arab Emirates, was severed when a ship dropped anchor in a restricted area - restricted because of the presence of the sea cabling. [and from another] http://www.itnewsafrica.com/2012/02/east-africas-cut-internet-cable-causes-disruption/ The cables operated by Teams, a company partly owned by the Kenyan government, were cut near the Kenyan port of Mombasa by a ship's anchor. Eleven days earlier, another ship dragging its anchor cut the cables of Eassy, a consortium of telecommunications companies. Eassy suffered a cut on 17 February in the Red Sea. Ships anchors have been blamed for torn submerged cables for the past several years, even when it is clear that the breaks occur in multiple places, simultaneously, and the cables are crossing plate borders. In both January and December of 2008 tears occurred, simultaneously, at Alexandrea, Dubai, and in Asia. All this was due to the rolling of the Arabian Plate, but ships anchors were blamed. During the 2012 tear, the dropping of the African Plate is clearly the cause, putting tension on the cable. 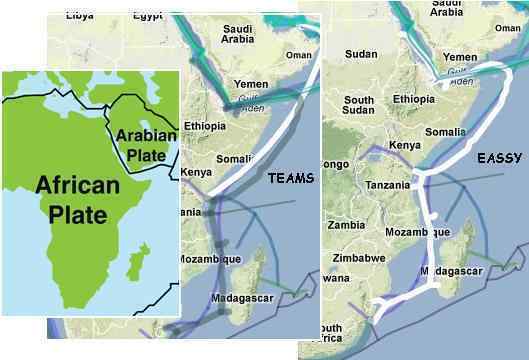 The cables attach to the Arabian Plate, thus the dropping African Plate has stretched them. Two tears occurred, 11 days apart, to separate cables. Is this a coincidence? Hardly.